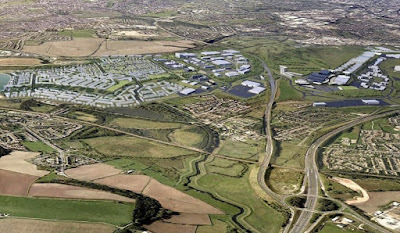 A second direct road link between Rotherham and Sheffield is being developed to boost the city region economy and enable users to avoid the heavily congested junctions on the M1. The £20m+, alternative, all transport route known as the Tinsley Link opened in 2016 following delays. It bypasses the congested M1 junction 34 South by providing a new section of highway beneath the Tinsley Viaduct. It is the northern route of a £30m Sheffield to Rotherham Bus Rapid Transit (BRT) scheme but a southern route between the town and city via Waverley has previously been denied Government funding. Now a second link through the Don Valley is set to play a key role in supporting the emerging Advanced Manufacturing Innovation District (AMID) and the vision for a Global Innovation Corridor that stretches across the region, linking people to key sites including Sheffield city centre, Doncaster Sheffield Airport, the Advanced Manufacturing Park in Rotherham and Barnsley's Digital Campus. 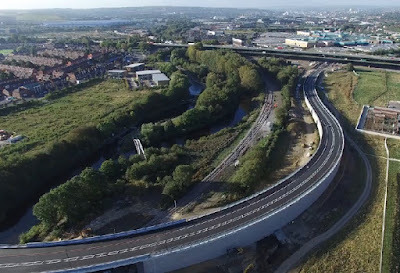 A new transport strategy published by Sheffield City Council includes the specific action to provide a new road link between Sheffield and Rotherham avoiding motorway junctions. The strategy explains: "Connections with our neighbouring towns, particularly Rotherham, must continue to be strengthened, in support of local and city region economies. We must deliver a transport system for Sheffield with the connectivity and accessibility needed to support and enable our growing and thriving economy. "Almost all movements between Sheffield and Rotherham must pass through motorway junctions. These junctions suffer significant congestion at peak hours, and there is little scope for increased capacity at these junctions given physical constraints. Additionally, the number of freight movements through the motorway and its junctions is exacerbated by constraints on the local highway network, notably low railway bridges, which also hinder accessibility and permeability within the Advanced Manufacturing Innovation District, raising a serious challenge for the city. "The operators of the motorway, Highways England (HE), now routinely object to and hold up planning applications, due to adverse impacts on the national Strategic Road Network. This capacity constraint will need to be eased if the growth of the city is to be achieved. Collaboration will be required between Sheffield and Rotherham councils, and HE, to ensure the solution addresses both Highways England's concerns and the city's need to support growth in a sustainable and equitable manner. "The X1 Sheffield to Rotherham to Maltby SteelLink bus service, started in September 2016 and the Sheffield to Rotherham tram-train service due to commence later in 2018, should help improve public transport connectivity, but this is not expected to be sufficient to address the issue in itself." The Innovation Corridor project is a key part part of the Government's Large Local Major Projects programme and the city region is bidding for around £100m from the Government's Transforming Cities Fund. Rotherham's capital strategy includes a £45m plan to widen the Parkway to three lanes between the M1 and Catcliffe. No details of the proposed route of the new link road have been released but it would likely pass through the Lower Don Valley. Recent planning documents for creating the River Don District on remaining sites alongside Meadowhall show that a parcel of land has been "left available for the possible future development of a new link road to the AMRC in this part of the Lower Don Valley, should that scheme be brought forward." The strategy comes at the same time as the Government urges the area to address air pollution. Sheffield and Rotherham Councils are preparing final plans on what measures can be introduced so that air quality limits are achieved within the shortest possible time. The plans are due by December 2018. In the short term, a £4.5m programme of bridge maintenance is due to get underway at Tinsley Viaduct on August 8. The project includes resurfacing, replacing barriers and waterproofing the steel structure and is due to be completed in April 2019. I do not understand the amount of money being spent on linking Sheffield and Rotherham, why would people from Sheffield come to Rotherham? As for Sheffield, it is so far behind Leeds, Manchester, Liverpool commercially and will never catch up. We can not carry on blaming Meadow Hall it is the people who we elect to run South Yorkshire who would struggle to run a hot dog stall are to blame. Sheffield trying to make some amends for its actions re. HS2? Both Sheffield and Rotherham had the opportunity years ago to develop a transport system that would have put them at the forefront, Supertram, if built correctly, would have routes to the new manufacturing park Hospitals shopping centres and suburbs. Maybe lack of money fear and planning expertise put a stop to it.